Medium straw color; expected exotic viognier nose of mango, pineapple, peach; melon, honeyed peach, orange zest, pear on the palate. Dry; light, fresh, vibrant in the mouth with grapefruit acidity; crisp, clean finish; pure fun easy drinker with good structure and minerality; excellent viognier fruit thanks to finishing in cement tanks. No oak influence. This comes from Languedoc-Roussillon region in southeastern France, a region decidedly on the rise on the wine radar screen after decades of being dismissed as France’s lake of pathetic plonk. No more, as this effort demonstrates. Vineyards are 30 miles north of Spanish border. 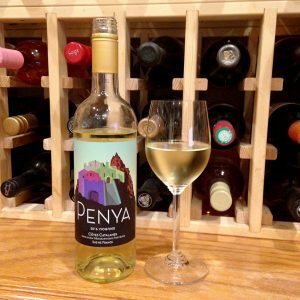 Cases de Pène is a tiny village near the Spanish border ceded to France in the 17th century; it is still know as “French Catalonia.” So, with this effort you get the best of ascendant Languedoc-Roussillon and the northeastern Spain, two of the world’s rising wine regions. The winery appears not to have a website, so there are no rhapsodic images of vineyards and hagiographic images of wine growers and cellar masters to present. No matter. This is substantial, versatile white wine at an astonishingly excellent price point. You owe it to your wine journey in life to give it a shot if you can secure a bottle.